I was really hungry today. I ate everything. Normally I sip the fruit cup or I eat one bit of peach. Not today. I needed calories in whatever form. I came home and ate a bowl of cereal to help get me to dinner. I don’t have much to say. It is what it is. I've heard of plastic cheese before but that pizza looks to be wrapped in plastic film! The pizza looks like it still has the plastic wrap on it. The pizza looks like it has plastic wrap on it. Eww, that's not cheese! What is that? I'm still curious about what this food smells like, too. Speaking of wraps, all of those plastic containers are likely leaching into your lunch! There's gotta be a better way…. Are the carrots cooked, or raw? I agree about the plastic wrap pizza! I have a sinking feeling that the cheese is just that shiny. Eek. Pizza again? They serve pizza t least 3 times a week at my school as an "option." On Fridays the kids get cut up leftover chicken patties to put on it. What makes your pizza even worse is that it is just microwaved. Yuck! I can't remember – why don't you eat the fruit cup? Um, I mean why don't you usually eat the fruit cup (since you ate it today). Personal preference or is there something gross about *these* fruit cups? ok what is wrong with that pizza? it looks like wrinkly old skin. and where is the protein? > It is what it is. my kids school serves pizza every friday and it seems like your school serves it every other day! That is the grossest looking pizza i have ever seen your poor stomach! well my kids had the choice of calzone or corn dog…looking at what they serve you guys at least theirs is a little appetizing (although tomorrow is pizza day, wait for that picture). seriously, I felt bad for you as soon as I saw pizza AGAIN. You poor dear. Gotta throw in my 2 cents with everyone else – what is up with the plastic-looking pizza? I love love pizza, even when it's bad, and I don't think I'd touch that. Yuck! That looks even worse than usual. I'm sorry. Is the fruit cup in syrup? HFCS? What does your school offer to the kids who are lactose intolerant or allergic to milk? I wonder how many ingredients are in the "cheese" they use to shellac that "pizza" with. Eek! That cheese looks like PLASTIC. Sadly enough I used to love the pizza at school and it looked pretty similar! The 'plasticness' of the cheese is just how the pizza looks because it's full of preservatives, been cooked, frozen, thawed, and reheated. All that does something to the cheese. This probably looks worse that the other pizzas because there are no meat-bits to break up the surface. 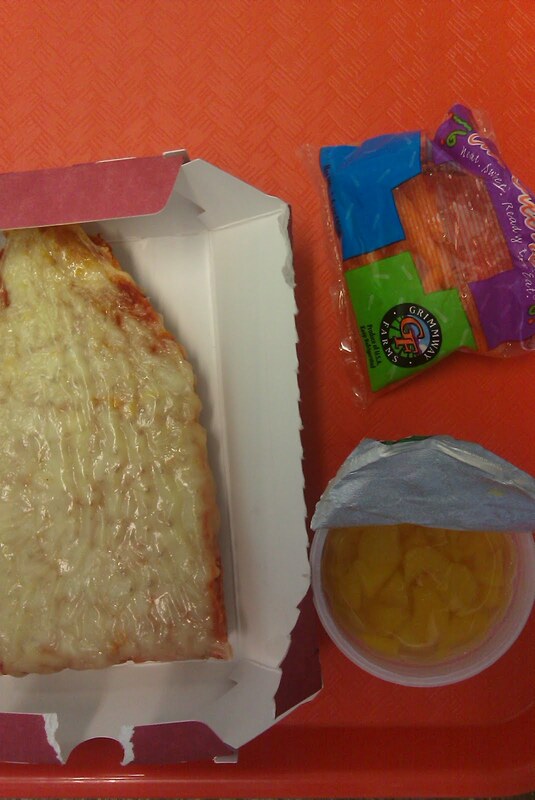 School pizza (what you're looking at here) was one of my favorite entrees. Though it usually had meat. 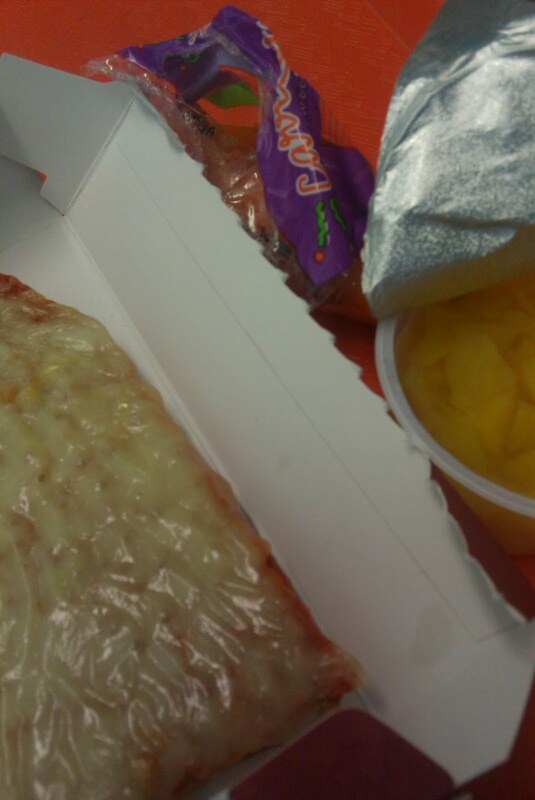 It does seem that this school serves different forms of pizza a lot more that the schools i went through growing up. that cheese looks so gross! Is the pizza cheese made of plastic? OMG! That cheese looks like plastic? I think the shininess is from emulsifiers added to the cheese product. The oils in real cheese will separate when it's (re)heated, and the emulsifiers keep that from happening. But there could be anything in that stuff. Even emulsified American "cheese" looks better than that. It should be criminal to serve processed foods without an ingredient list. yeah like many others said, that pizza looks plastic! I am amazed at the amount of non-biodegradable waste generated from this one school. Every lunch seems to be packaged in styrofoam and plastic. It is no wonder we are drowning in a sea of garbage. Looks exactly like the pizza what was served at my school when I was in elementary school… twenty years ago. The pizza looks like it has skin on it. Ewwww.